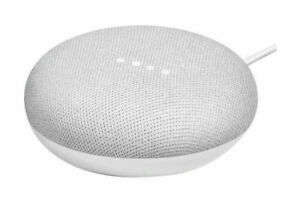 Google Home Mini Smart Small Speaker Chalk Grey Google Assistant New Free Ship!! Immediate payment of C $51.99 is required. I just bought this google mini and am very pleased!! The speaker arrived early which was nice. it works as expected so i am very pleased with my purchase! I like the fabric look to it & you can put it in your kitchen while your cooking & ask Google all kinds of stuff or have it on your end table and ask Google anything like when your watching TV & you wanna know more. This does all kinds of different stuff.